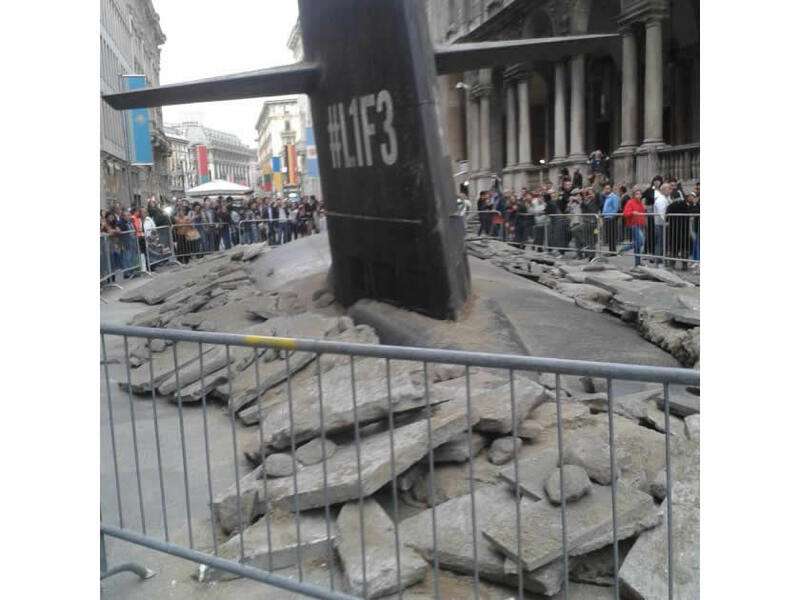 An L1F3 submarine emerges from the underground canals in the center of Milan. No, not really. It was ambient marketing by the Europe Assistance Italia Insurance Company. The fin and dorsal of an L1F3 pushes through the concrete breaking the cobble stone, smoking and leaving debris on Via Mercanti near Piazza Cordusio. A completely staged scene of fire fighters, rescue crews and TV News broadcasters were all at the spectacular set. Videos and photos were on the web in record time through every social networking channel. It really fooled a lot of people – it wasn’t until the emergency ambulance came with the slogan “Save your #L1F3” and other slogans appearing like “Anything Can Happen” (Tutto può accadere) that it became clear it was a marketing stunt. Kudos to the creative bunch at M&C Saatchi who thought this one up!